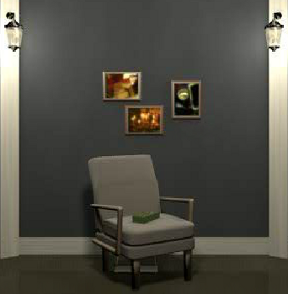 The tradition of escape-the-room games has brought us into many circumstances of being trapped and needing to wile our way through the exit. Our reward? Usually it's merely the deep gratification of outwitting the savvy programmer who locked us up in the first place. Every now and again, though, one of our favorite game designers brings us something more: a room that is truly satisfying to explore and an exit scene that is magnificant to behold. Robamimi is just such a designer and Station is a prime example of why. Much like all of Robamimi's creations, Station is attractively furnished and user friendly. You begin inside a hexagonal room, following a changing cursor to pick up tools or interact with puzzles and clues, and must employ problem solving skills as well as deductive reasoning to make your way through the door—only to learn, with a grin, that you've only just begun. Although the game itself has just one ending, the use of multiple rooms to "break into" makes it feel like more. Because of its scope, Station is higher on the Robamimi difficulty scale; figuring out solutions takes extra work and quite a bit of back-and-forth, running up and down stairs, as well as some doodling in your notes. The non-standard layout also means more to contemplate and put together, and a greater likelihood you'll overlook an important bit of information or miss looking in a tucked away corner. It takes a while to get oriented, understand what's going on, and make sense of the riddles presented. Along those lines, the "Hint" function is helpful yet hints are more obscure this time, pointing you in a general direction without giving away all the signposts for the solution. You're likely to recollect Hermit Rabi and Wonder Fountain during this venture because of the puzzle types as well as the maze-esque navigation (by the way, if you enjoy this one, you're sure to like that one, and vice versa). Due to its length and a few reported quirks late in the game, using "Save" before starting a puzzle is also recommended. When you're ready to escape the ordinary milieu of the weekday in the great JIG custom of being locked up, to challenge your thought processes even as your aesthetic sensibilities are serenaded, and treating yourself to a game that's diametrically challenging and relaxing, click the button below. It's a wonderful ride from beginning to end! Not loading? Try the alternative link: Station. Thanks to Itt and Cyberjar88 for suggesting this one! You begin inside a hexagonal (6-cornered) room, facing a blank wall and a small podium. Click on the podium to inspect it. On its front is a symbol. Make a note of what it looks like. Click again on its top to see a hole where something appears to be missing and the words "open" and "close." Turn left. Now you see a desk. Maybe it contains some helpful information; give it a look. Pick up the MANUSCRIPT PAPER from the desktop. Make a note of the two books stacked here. "The cat sat down opposite to the king." It sounds like part of a riddle. The clock-thing has twelve buttons and the single pointer will move to where you click. Turn left again to face the door. You need a 5-digit code to unlock the door. Note the hexagon design and the white triangle in relation to the door. When you turn left from the door, you see window shutters. A key is needed to unlock them. Turning left after that brings you before a chair and three more pictures. Look over it all very closely. A note on the wall says "MONTH DATE TIME"
A 3-digit code is needed to open it. Take the BOOK you found under the chair and turn left twice. Add your BOOK to the stack already on the desk. Now you have another clue. Enter the correct code to unlock the box. So put 2 1 6 into the code box and click "OK". When you open the box, get the DART. After examining all the pictures in the room, you'll have the information needed to work the Clock-Thing. Click the correct sequence of buttons to open a hidden panel on the clock-thing. a KEY to the window shutters. Once you get the KEY from the clock-thing's drawer, turn around the face the shuttered window. Use the KEY to unlock and open the windows. Now, through the open window, you can see a green balloon on the opposite wall. Back up and inspect the Flower picture again if necessary. Turn to the door and examine its lock. Use the clues you gathered to enter the correct code then click "E". The lock panel will read "OPEN" when the code is correct. Back up and open the door. Step through to the stairwell. Robamimi likes to test your observation skills. So, before you go downstairs, make sure you inspect this landing. Click on the door to look at it from this new angle. Then, click the door again to close it. a KNIFE PANEL! Pick it up and read it for another clue. "King had a weapon in his right hand." Back up to head down the stairs. Now you are facing another door with three knockers on it. To its left is another podium. When correct, the blue light comes on. Under the stairs you'll find a FISH PANEL. It's clue: "The cat got a favorite food in its right hand." You can also see there's something on the floor, but it's too hard to see clearly from this angle. Examine the three knockers on the door at the bottom of the stairs. Click on the knockers in the correct sequence to open this door. Use the clue from the MANUSCRIPT PAPER to derive the answer. From where you're standing, sketch the hexagon design on the floor and then note where the white triangle is located on it. When you first step inside the second downstairs room, you face a bell hanging over a sign. Zoom in to read it. The sign says "Never Give Up" and you can ring the bell. Keep ringing the bell. Don't stop until something happens. Turning left from the bell, you see a walled-off archway. So, turn left twice more. Now you're facing the door. Open it. Note that the stairwell's room also has a hexagon design with a white triangle on it. Paying attention to where you're standing, make a note of where it is in relation to this room's own hexagon/white triangle. Inside the control room, to the right of the bell, is a hexagonal podium. If you've followed this walkthrough exactly until now, you have 4 PANELS to use in this puzzle. You need one more. Insert the DART into the hole in the podium's front. Then, click on the dart like it's a handle to pull open the podium's front panel. "King got a diamond at last." 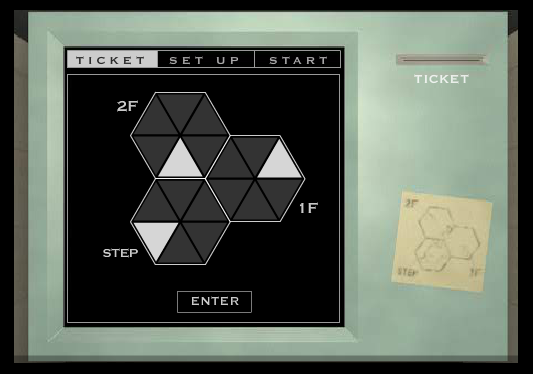 You need to insert each of the 5 triangular PUZZLE PANELS in the correct order. Solve the riddle given on the back of cat, knife, fish and lion pieces to determine the proper arrangement. 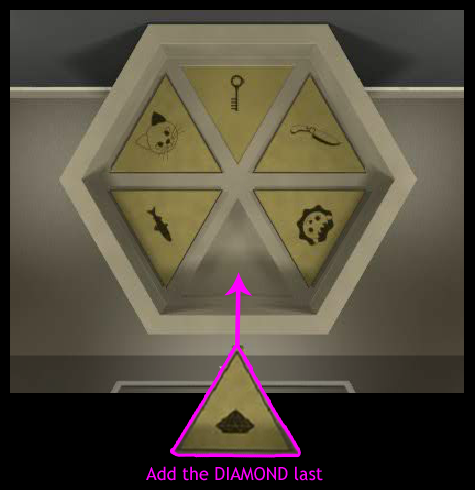 Remember to add the diamond LAST. Also consider the clues "on his right" to put yourself in that character's perspective ( When you look at someone, their right is on your left). Take the WHEEL ("Part of the SL") off the front of the train. turn right and go through the door. Turn left and click on the bottom of the stairs. Then click the stairs again to go up to the second floor. Click the doorway to enter the first room. Turn three times to face the little podium with the spoked-wheel design on its front. Insert the WHEEL ("Part of the SL") into the top of this podium. Click once to turn the red spoke to the "OPEN" position. Back up twice, turn around, and go out the door. Go downstairs, open the 3-knockers door and enter the second downstairs room. Turn left twice. The words "CONTROL ROOM" are replaced with a hallway. Go down the hallway one time toward the control panel. it's a MAGNIFYING GLASS. Pick it up. and the main MAGNIFYING GLASS piece. Inspect the MAP of the rooms to get a sense of how they relate to each other. To get a train TICKET, examine the top of the control panel. On the monitor is a design: three connecting hexagons. You can click a segment of each hexagon to change where the triangles are located. Using the information from the map, as well as the patterns on the floors of each room, put the triangles in the correct positions. When done correctly, the screen will change to "SET UP" and a ticket will be issued out of the top right corner of the control panel. Use the MAGNIFYING GLASS to read it. To SET UP the train for departure, you need to enter the correct code and click "ENTER". Entering the proper code will make the train rails appear across the floor. The control moniter now indicates you need to add the WHEEL "Part of the SL" back to the front of the train. Zoom in on the top of the wheel podium and click "Demount" to take back the WHEEL ("Part of the SL"). But, without the wheel there, the control room will be closed up again. Insert the HANDLE from the magnifying glass and click to turn it back to "OPEN". Replace "The part of the SL" WHEEL on the front of the train. Turn around and go back to the control panel. Now you need to a 6-digit number code. When you input the correct number,click "E" to enter it.
. I hope I have done the spoiler right! Made it through without a walkthrough! Got stuck for a while with one puzzle until I realized I needed to take it literally! When I almost gave up in frustration and started ringing it repeatedly, it opened. "Never give up" is the clue. Click here for help with using spoilers. You can then use "preview" before submitting to test how your post will appear to others. Thank you! Although not the first designer out of the starting gate this year, Robamimi sprints to the front and takes a commanding lead. This is an excellent game. It has been a disappointing start of 2013. With the exception of Detarou, the previous games of this year have been mediocre at best, if not rehashed. Let's hope Punxsutawney Phil's prediction of an early spring comes true so that Tesshi-e and Haretoki wake from their hibernation soon. Robamimi has brought much relief, despite being insulted by the Best of 2012 results. I think I'll have a good day today, even without a Happy Coin. ... ok, that was lame, I'll go back hiding myself. I don't understand why the three-triangles answer is what it is. Hmm not sure if I found a bug or not, but one of my triangles disappeared when I was messing around with solutions for that puzzle. I'm not sure it's worth it to start over. That's a bummer. Same here, frickineh. Lost the cat and king that way. Had to start over. Recommend, SAVE BEFORE starting the Hexagonal Puzzle! That was a joy. Brilliantly logical and great theme. And delightful too. In each room there is one view that will allow you to look at the floor. Note where the triangle is in relation to the door in the room, and then compare that to the map. Just be sure that in the 1st room you are not confusing where the window is drawn on the map with where the door to the room is. Does this game have a problem with Chrome? It won't load past 37%. AWESOME!!!!!!!!!!!!!!!! And thank you elle for the fantastic walk through. I only needed help on a couple of things. Lunch is over time to go back to work in a good mood. This was so much fun! I just needed to use a couple of in-game hints and no walkthrough at all. What a nice way to start my day. My only gripe is the way it plays the animation Every. Single. Time. you need to go up or down the stairs. After the fifth time or so, it got seriously tedious. ...we'd missed when tossing the dart at the balloon. Yeah, I lost one of my triangles too- spoiled the game. SAVE before starting! I'm not putting this in spoiler tags as the real spoiler is not knowing! I admit I had to have a little help from the walkthrough... but WHAT A GAME ! Really good game. Great puzzles, nice atmosphere and whimsically satisfying ending. That was well worth the time spent, unlike many of the games I play solely out of habit/addiction to gameplay. I loved the background music and the general atmosphere. And the ending sequence was the opposite of anticlimactic. (I know that's a double negative, but connotation holds above grammar.) The little hints added in were perfect guidance without spoiling the fun, and were completely optional. I want to see more games like this. That last still image should be downloadable as a wallpaper.